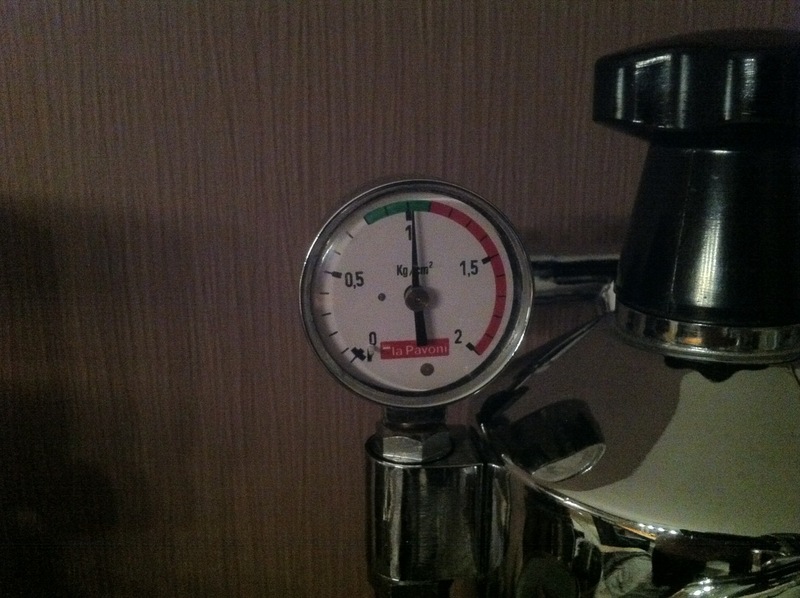 As you can see the manometer reads 0.3 – 0.4 Bars of pressure without even being attached to the boiler. 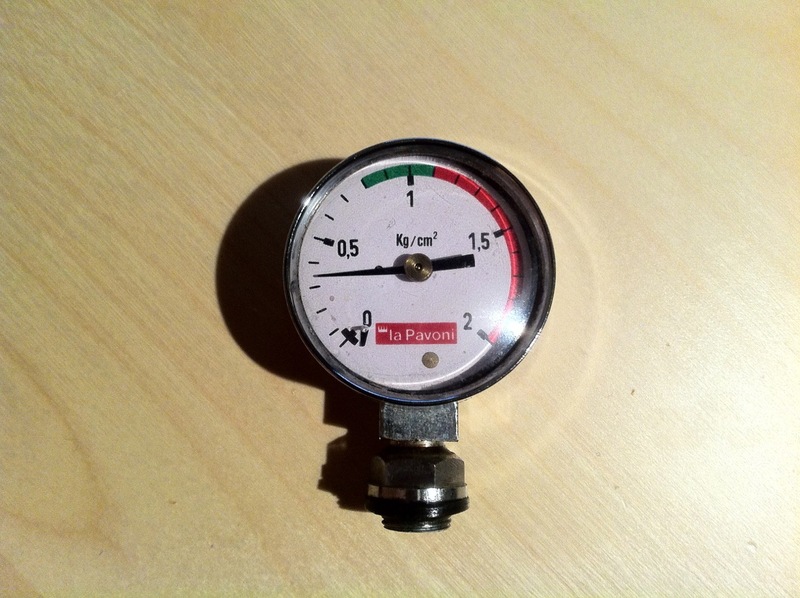 While I don’t pay attention to the boilerpressure most of the time it is however a very useful tool to have. The principle behind adjusting it is rather simple but it does require opening up the manometer itself. Friendly reminder: the instructions below are a suggestion. Follow them to the letter and you should be fine. However if you do decide to try this yourself you do so at your own risk! 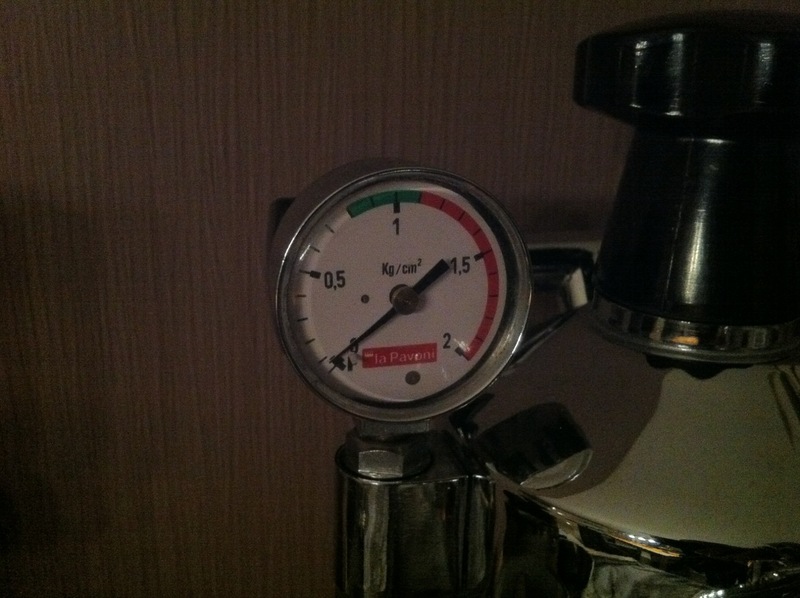 Opening the manometer is luckily a rather simple job. I removed the manometer from the La Pavoni for easier access. Next I removed the front bezel and plastic screen. As you can see in the picture above I used a screwdriver that I rested on the inlet while carefully applying pressure with the tip of the screwdriver on the back of the bezel. For extra protection I could have wrapped the screwdriver in some tape to minimize the chances of scratching the chrome on the manometer. After i put the bezel aside i removed the screw on the back of the manometer. I then tilted the casing slightly back and moved it down the inlet to remove it from the manometer. The insides of this manometer are quite basic but very delicate nevertheless. 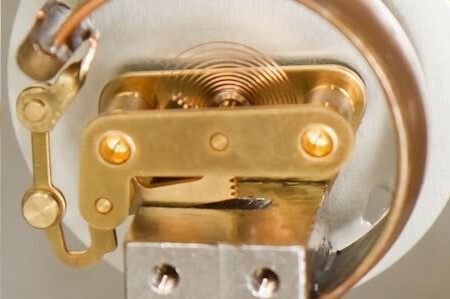 The needle is attached to a tiny springloaded shaft that has a little gear on the back of the dial. Behind the dial is also a large circular copper actuator. To free the little gear from the actuators toothed arm I turned the needle clockwise towards the endstop, lifted it up slightly and moved it past the endstop. When I got to the 0.2 or 0.3 mark on the dial the actuator slipped off the little gear. 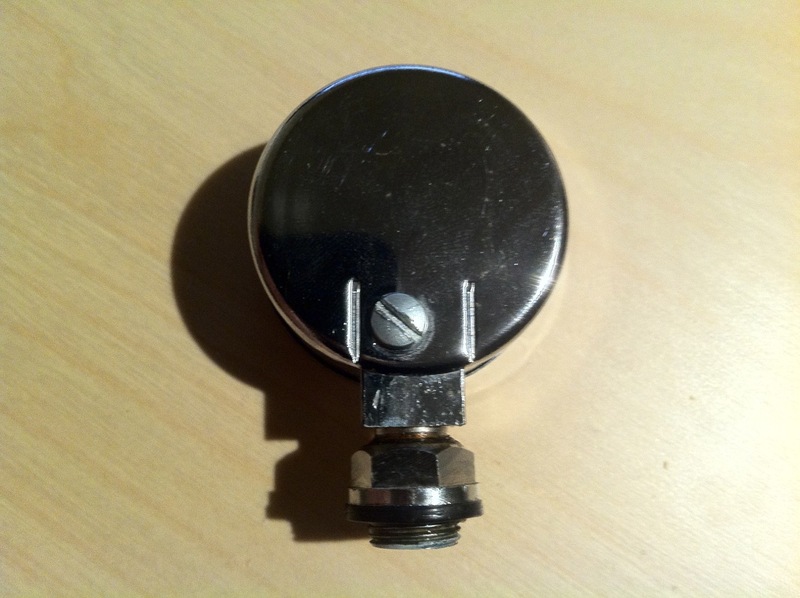 The above image shows the inner workings of a newer version manometer for the La Pavoni. Technically it is exactly the same, the only difference is that it has a black plastic casing which is held on with two screws. To adjust the starting position of the needle back to the 0 bar range I carefully moved the copper tube upwards so i could reposition the needle and its gear. I put the needle itself on top of the endstop and let go of the copper tube (gently!). The gear and actuator engaged again and returned to their default positions. As you can see in the picture above the needle isn’t resting against the endstop. Initially however the needle did rest against the endstop so i repositioned the shaft again (as explained in the previous paragraph). I reassembled the manometer and La Pavoni and then verified that it worked correctly by heating up the boiler. Once the water in the boiler heated up the needle started moving towards the 1 bar mark where the heatingelement is set up to shut off. Just like it’s supposed to. 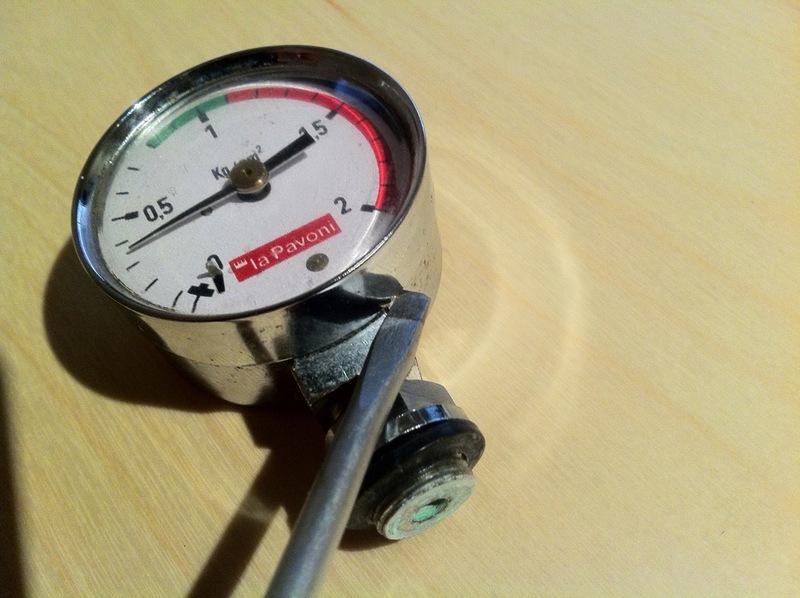 The photo showing the inside of the manometer was kindly borrowed from a fellow Kaffee-Netz.de member named Odin. I’ve just made the operation. Works good now. Many thanks for the trick. awesome. it was very easy to do.